Happy Howlidays from The C.A.R.E. Channel! Play The C.A.R.E. Channel and Win! The C.A.R.E. 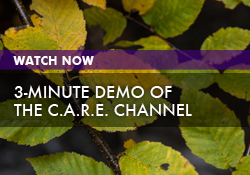 Channel Webinar Series – HCAHPS and C.A.R.E. Whitepaper: Whole Person Care and C.A.R.E. Remember What 18 Was Like? Information and Misinformation: Will Reality Please Stand Up? Patient Safety & Quality: "Wellness is Not Enough!" What Informs the Patient Experience? How Do We Add Mission to An Admission? Patient Safety: It’s About the Culture! The Patient Experience: What Matters? Can We Start an Epidemic of Kindness in Healthcare? Reducing Hospital Noise: What Do We Do First? Sound Control vs. Noise Control: What’s the Difference? Why is Patient Safety Ever in Question? Would You Like a Single or Double Patient Room? Compassionate Care: Who Have We Become? How Powerful is Music at the Patient Bedside? The 5-Star Patient Experience: What do Stars Have to Do With It? Prime Time TV Programming for a Hospital Waiting Room? What Happens When Rural Hospitals Close? Music to My Ears – Guest Post by Wendy Leebov, Ed.D. The Role of Television After a Terror Attack: Good for Patients? How Does the Hospital Room Support the Patient Experience? The Age of the Patient Experience: When Do We Get Good At This? Which Week Isn’t Patient Experience Week? Waiting, Waiting, and More Waiting: Is This Quality Care? Nothing But Words: Does HCAHPS Truly Measure the Patient Experience? Music as Environmental Design: What Does the Patient Hear? What Do Patient Satisfaction Surveys & the HCAHPS Survey Tell Us? What’s the Difference Between Patient Satisfaction & Patient Experience? Nature Videos on Election Day – What An Idea! How Do We Improve the Patient Experience in a Time of Uncertainty? Is Whole Person Care What Patients Want? Is “A” Patient Experience “The” Patient Experience? Encore Post: What’s the Difference Between Sound Control & Noise Control? Can Hospital Noise Be Canceled by Other Noise? What Do We Know About Music and Music Therapy for the Sick and Tense? What’s the Patient Experience Really About? 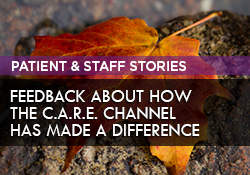 Encore Post: What’s the Difference Between Patient Satisfaction & Patient Experience? Hurricane Harvey: Did Houston Have a Massive Stroke? Is Integrative Medicine in Better Alignment With the New Patient Experience Model? Can We Meaningfully Dissect the Patient Experience? Are You Ready to Improve the Patient Experience With Virtual Reality?